The Banana Sorbet is a perfect blend of Banana O.G. crossed with the smooth flavour texture of the Sorbet. Banana Sorbet (Sorbet Collection) Feminized Cannabis Seeds by DNA Genetics Seeds: The Banana Sorbet is a perfect blend of Banana O.G. crossed with the smooth flavour texture of the Sorbet. Banana Sorbet is great for growers both indoor/outdoor or in a greenhouse. The medium size of the plant will not take up too much space and will still produce between 450–500 grams of high quality Californian buds. 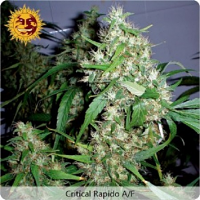 The 8-9 week flowering time of this hybrid produces large, dense nugs that are heavily covered in crystals that is perfect for concentrate and hash makers looking for the next wave.